Wildlife on a tropical island is always incredibly fascinating. Elegant birds, colorful fish, large reptiles and scary insects: every day could be an occasion for an interesting, unexpected encounter. And Curaçao doesn’t make an exception in this sense, with a rich and diversified flora and fauna. The sea is full of life and it took me only few snorkeling rounds to see eels, parrot fish, porcupine fish, octopus, a sea snake, flying fish and several other beautiful marine creatures. Reptiles play an important role in the island ecosystem: we found whiptail lizards, endemic to Curaçao, everywhere on the island. 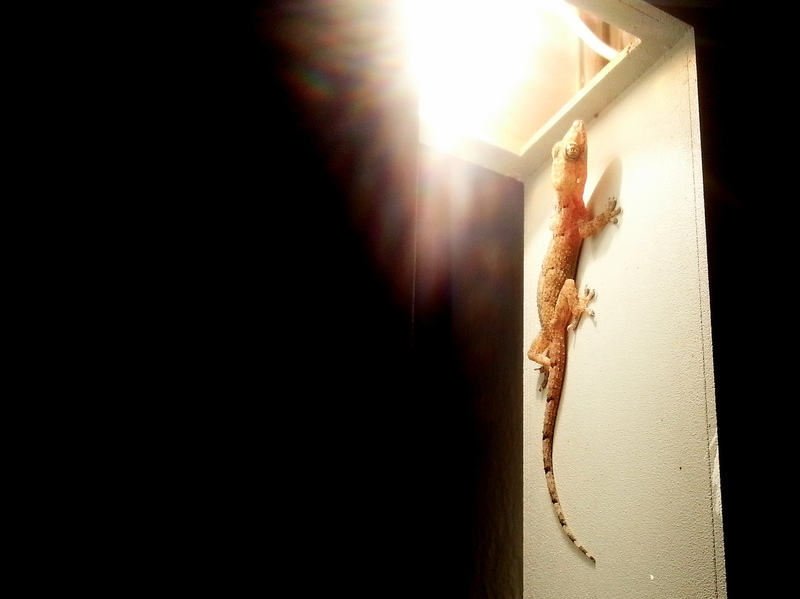 A gecko was always waiting for us outside our suite door, looking for some mosquitos to capture. Sea turtles and snakes can also be seen quite commonly. 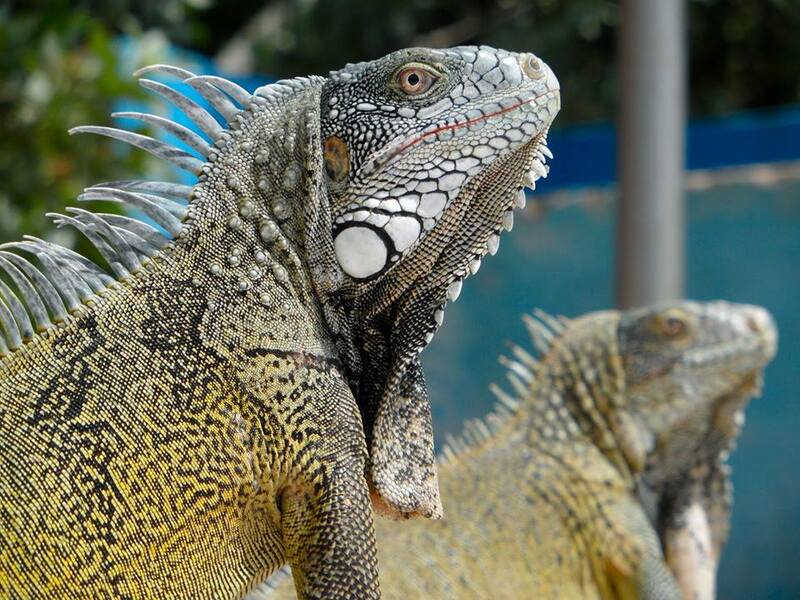 Without a doubt, though, the iguana (“yuana”) is the king of Curaçao reptiles. They colonise some of the local sandy beaches, climb on the trees and rest on rocky cliffs. They even invaded our space using our beach towel for a sunbathing session. 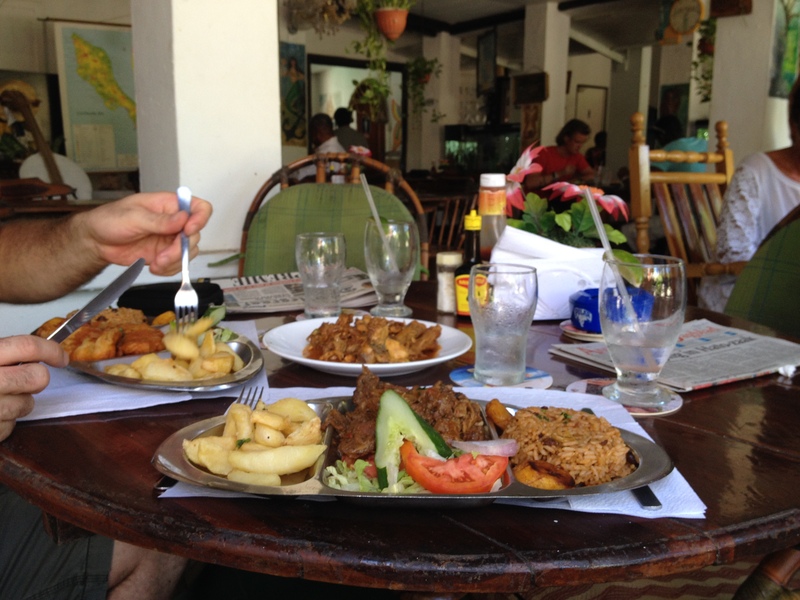 Though Iguanas can not only be found on the beaches and trees of the island, but also on the dining tables….as a stew! Iguana meat and eggs are considered, in fact, powerful aphrodisiacs and iguana soup is a local delicacy. Could we not try this original exotic dish? Of course not! And not just for the aphrodisiac properties….come on! :) On the day we climbed the highest peak of CristoffelPark, the larger Natural Park of Curaçao, we stopped by Jaanchies, a local rustic restaurant in Westpunt. 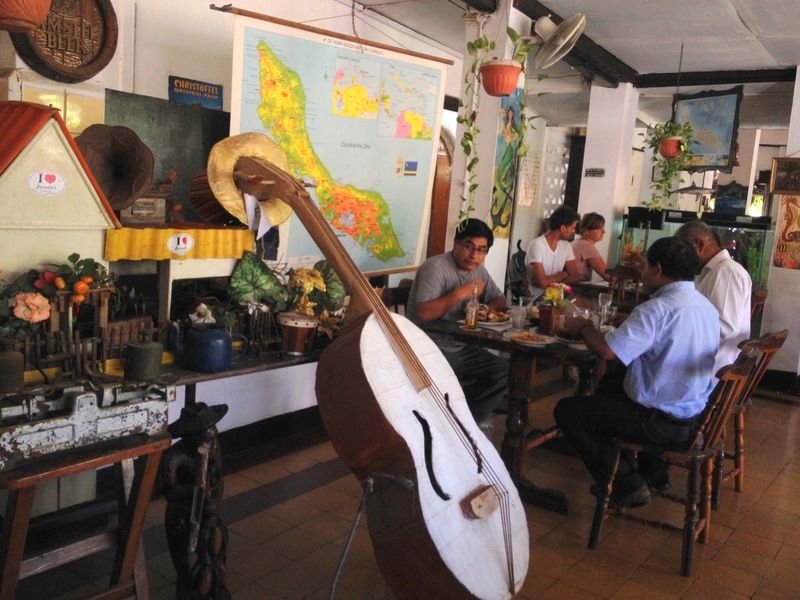 Jaanchies is a mix between a rustic restaurant, a garden and a chill-out lounge. We sat on two of the relaxing swing chairs and were soon welcomed by Jaankie himself that came to us with a detailed (and very funny) verbal menu with the dishes of the day. 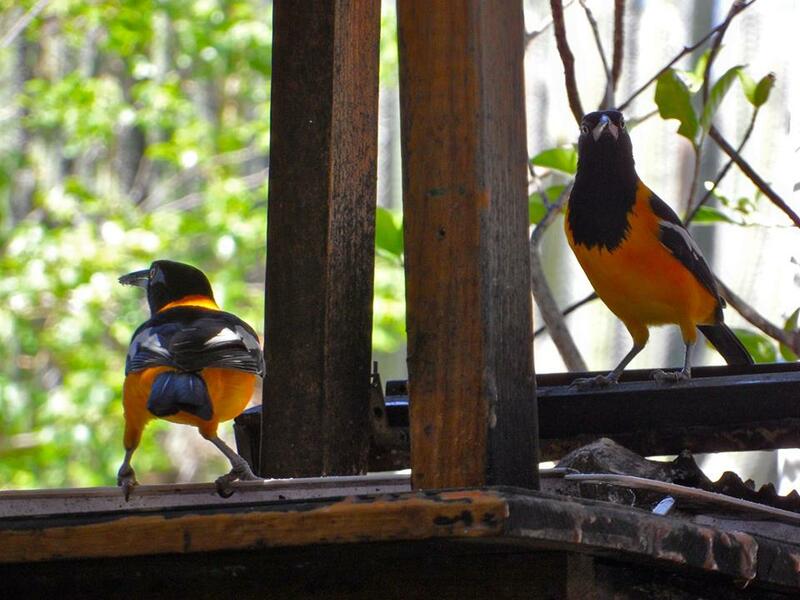 Between the order and the meal, we had plenty to see and observe from our table: one side of the restaurant has, in fact, no walls, and goes directly into a little outdoor garden where beautiful birds (including the orange/yellow and black Tropial) fly in and out to drink, eat and enjoy the shade. Then the dishes arrived. We ordered chicken stew, that was juicy, well seasoned, and worked very well with the side potatoes. 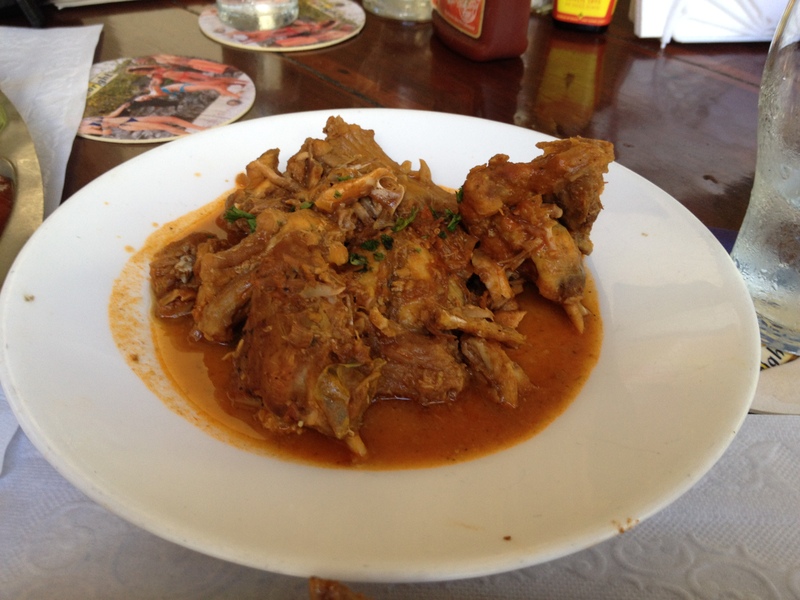 Then the goat stew, which is another typical dish of the island. Considering the fact I have tried goat meat, also as stew, in several other countries, I was impressed by the tenderness of this meat and by the flavour that was not too strong but still really flavorsome. And then, finally, the iguana stew. At a first sight it looks like any other stew of white meat. If you don’t have quite an expert palate, you may think it is, indeed, a common white meat stew. Though even a non-expert foodie would realise it is a not common animal when it comes to the bones: a lot, small and with weird shapes never seen before. The meat is tender, very lean; someone said it reminds of chicken. I would rather say something between rabbit and frog, but still…a bit different. We ate every single bit of it and truly loved it. Delicious!